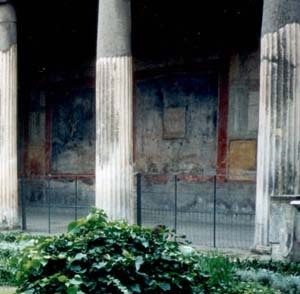 This image shows part of the colonnaded walk enclosing the peristyle garden of a house in Pompeii. The remains of a fresco, an art medium composed of wet plaster and paint, is visible on the wall behind the two columns. -- Photo by J. A. Geary. House walls were plastered and painted with decorative panels, scenes from mythology or from daily life. Exteriors, and walls of the less wealthy, might be bright solid colors (often an ocher yellow) or marked and painted to resemble stone. Columns of stone, wood, or intricately shaped bricks, plastered and painted to look like stone, supported the roof. The roof beams were generally of wood, though stone might be used as well for short spans. Both Etruscans and Romans used the arch and the vault, though the possibilities opened up by arch construction were not fully explored until later. Wealthy homes might also boast of an interior garden, the peristyle garden, centered by a fountain and surrounded by a colonnade, columns supporting the roof of a covered walkway. Lead gutters and pipes channeled rainwater from the roof into storage for the household. Terra cotta, the familiar baked red clay of modern flower pots, was used extensively by the Etruscans for roof tiles, column capitals, decorative friezes around the tops of buildings, statues, pots and other household uses. The Romans preferred stone or marble for most structural and decorative uses, copying the Greeks, but must have appreciated the way terra cotta remains impervious to weather (unlike the soft volcanic stone of the area around Rome) and continue to use it for roof tiles to this day. Roman roofs were made of overlapping tiles: "tegulae," flat, basically rectangular ones with flanges along the sides, and "imbrices," half-tubes to cap the space over the flanges. Fittings for the corners and edges of the roof, to direct rainwater and for decoration, were also of terra cotta, often molded as fantastic or grotesque faces. Doors and window shutters from Republican Rome were generally of wood, though they might be reinforced with iron. Ironwork gates and grills provided security. Evidence of paneled and louvered designs similar to what we use today have been discovered in Pompeii. A noticeable difference was in placement. The Roman domus opened inward. The front entrance was often the only entrance to the house, although there might be an additional service gate to a back alley. Wide doorways with draperies and folding doors of louvered panels opened the dining rooms and other public areas to the atrium or peristyle garden. No windows opened onto the street at all. The closest thing to a modern window in urban houses was an occasional opening, often covered by a grillwork of wood or iron, probably just to let in light. Windows might also be covered with translucent materials such as oiled sheepskin or thin sheets of mica or gypsum. By the time of Augustus, the Phoenicians had learned to blow glass, and to create sheets of it clear enough for windows. The Romans, true to their common practice of adopting anything from other cultures that made for a better quality of life, soon were adding glazed windows to their houses. The urban domus might include shops opening onto the street. Ruins show channels in the door frames and sills of these shops that apparently held the ends of a door that may have pulled down something like the cover of a roll-top desk or a modern garage door. These were surely made of wooden boards, but historians don't know how they were held together -- with canvas, leather, or iron rings, perhaps. Multi-story apartment houses, insula or "islands," were home to urban Romans who couldn't afford their own domus. The ground floor was generally set aside for shops or other commercial use. The next floors might have two or four "luxury" apartments, with the density increasing and the apartment size decreasing on upper floors. Before the days of elevators, there was no such thing as a "penthouse." We don't know the height of the tallest Roman insula, but Augustus limited the height of insulae in Rome to 70 ft. and a later emperor to 60, so seven or eight stories may have been relatively common. Writers of the Republican period complained of the dangers to inhabitants of the insulae, that they often burned or collapsed, killing those who lived there. The remains discovered seem to be of sturdy, well-constructed buildings, but that may be because the worst ones had all been replaced in ancient times. If we visited one of these ancient apartment houses, in addition to the obvious differences, like no electricity and no bathrooms on upper floors, we might notice the lack of hallways. A great deal of space was used up by multiple stairways serving only apartments directly above one another. The rooms within an apartment opened directly into each other, so that if there were multiple bedrooms one might have to walk through one to get to another. The walls of buildings in the ancient Mediterranean world were generally brick or masonry rather than wood. They were thick by modern standards, often one and a half to two feet in buildings of only two stories, and thicker in proportion for taller buildings. Modern buildings, even those that appear to be of stone, are supported by frameworks of steel if they reach great heights. The Washington Monument, in Washington D.C., is the tallest modern building constructed entirely of stone and its walls are 15 ft. thick at the base to support its 555.5 ft. height. The Greeks built their walls of stone blocks cut and trimmed into equal rectangles. The wall looked much like a modern brick wall built with the joints between the bricks alternating in each layer. Greek walls were two blocks wide, with occasional blocks or courses laid crosswise to bind the two rows together. Romans sometimes built in this "Greek fashion," called opus quadratum. For buildings of heroic size the Romans sometimes built with huge blocks of volcanic tufa. Tufa is relatively porous and lightweight for stone, but the blocks still weighed many tons. Early builders may have used ramps of sand or earth, as is speculated for the Egyptians. But Vitruvius describes several machines for lifting and placing stones of great weight, ropes and pulleys supported by cranes and frames of poles. Rather than use lime mortar, which dried out and cracked when used with porous stone, the Romans precisely cut and fit the stones together and held them together with clamps of bronze or iron. Today we see these walls as massive pockmarked ruins, their "clothing" of marble and metal clamps pillaged by the builders of the Renaissance, who used the ancient buildings of Rome as their "quarry." Instead of a solid wall of bricks or stone blocks, a Roman wall more often had facings of brick or stone, a cavity in the center filled with rubble and mortar or packed clay, and a coating of plaster. Roman bricks were large and flat by modern standards, approximately eight by eighteen by one and one-half inches. Common brick was mud-brick, and even if it was cured the recommended two years before being used, it was sensitive to moisture and weathering. This, and the fact that the stone available around Rome was a relatively soft material, volcanic tufa or limestone, surely led to the practice of plastering walls inside and out. Fired, or "burnt" brick was also used for construction, as was recycled terra cotta roof tile. Vitruvius reports that only burnt brick could be used for new construction of insulae in Rome during his time, as common brick, or mud brick, walls needed to be thicker than regulations allowed. Perhaps that is why the ruins of the relatively newer insulae at Ostia survived into modern times. Stone walls or facings might also be made of trimmed rectangular stones of irregular sizes, "opus incertum." The stones could not be laid in straight courses, but when carefully fitted together with some stones extending deep into the wall or even through to the other side, this pattern made for a very strong wall. These patterns of construction depended on lime mortar to hold the elements together.